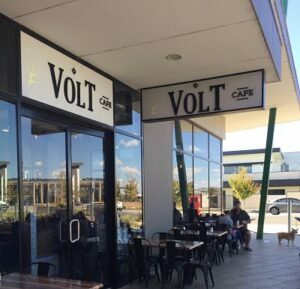 The Volt Cafe is a must visit if you are looking for great gluten free food near Cranbourne! As one of the owner’s has coeliac disease, it means they understand gluten free requirements and also have a dedicated gluten free prep zone. The cafe is located on the outside of the Selandra Rise Shopping centre in Clyde North. This area is mixture of rural properties and new housing estates and is just past Cranbourne (which is around a half hour drive from Chadstone shopping centre). As they have outside seating it is also dog friendly (that is my pooch in the photo above!). 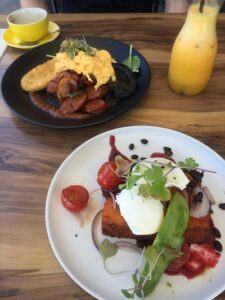 Being a daytime cafe, they specialise in breakfast and lunch dishes. My husband loves an English style breakfast and chose the ‘high voltage’ breakfast and he couldn’t believe the huge size, but still managed to finish it off! He had normal sourdough toast, but gluten free toast is available. I chose the sweet potato rosti (bottom plate above), which again, was very generous in size. It had fantastic flavours with the poached egg, avocado, black bean and chorizo salsa and beetroot puree. 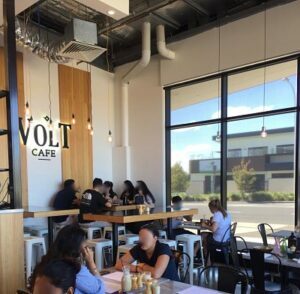 The cafe has a trendy feel, with a mixture of high bench tables and traditional tables inside. It was very busy when we visited for Sunday brunch. The menu is available on Zomato with GF marked up. There is a wide variety of choices, such as shakshuka, granola, burgers, chips, croquettes, nourish bowl, calamari salad etc. A number of muffins are made fresh daily, and most of these are also gluten free. Drinks include all the usual options, as well as smoothies and juices. Almond and soy milks are available if you are dairy free. There is a small children’s menu and two of the four options are gluten free. Bookings are recommended, particularly on weekends, as they get very busy. We left very full and satisfied and thought it was worth the drive for safe gluten free food near Cranbourne. The cafe is not far from the Cranbourne Botanic Gardens, so it is a convenient place for some food before wandering around the gardens.